Over the years I’ve seen so many pots and pans come and go. Seriously, when those old pans get too rusty to cook with, what else is there to do with them except throw them out? Well, believe it or not, there are tons of ways that you can repurpose cooking and baking dishes – not to mention just about anything else – and turn them into something useful once again. Even if they have holes or are just too worn out to use them for cooking, you can put those metal dishes to great use in other areas of your home – it’s time to think outside the kitchen! First of all, let me say how much I love to repurpose. I mean, you can literally turn something into something completely different and save it from the trash heap. You also get something amazing to use from that old item. Just look at these 20 ways to repurpose old chairs. There really is something that you can make with old items that will beautify your life. 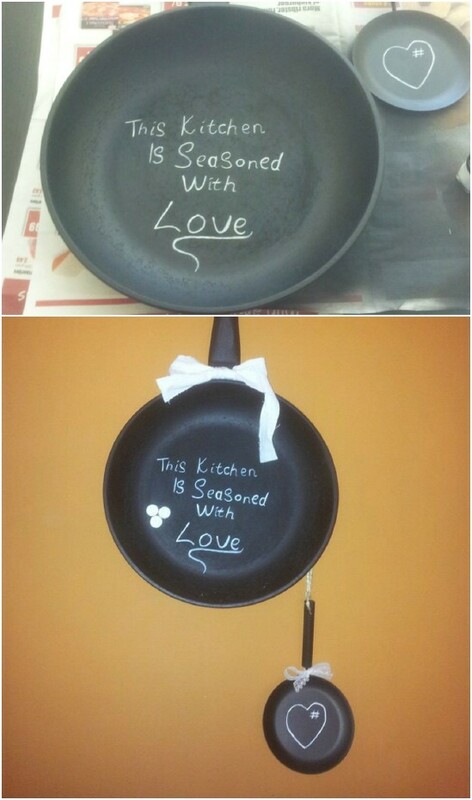 And, you could actually turn those old pots and pans into wonderful gifts for someone special. If you’ve ever thrown out a cookie sheet because it just got too black to use or you’ve noticed that your favorite spaghetti pan is just too warped and dented to cook with any longer, you are going to love these repurposing ideas. You can turn those old baking and cooking dishes into wonderful creations from clocks and bird feeders to chairs and lamps. Seriously, there is a repurposing project in here for you. And, be sure to also check out the amazing things that you can create for your home in my 30 frugal ways to use old mismatched socks. 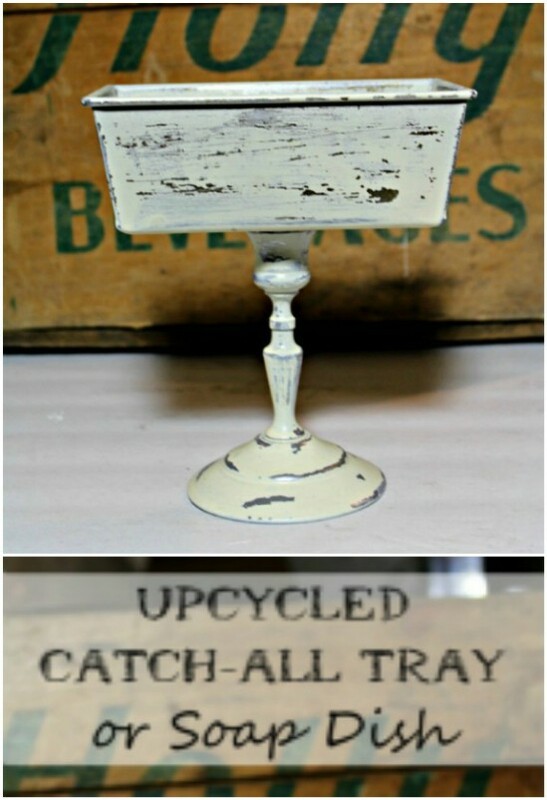 If you love to repurpose and reuse old items, this is definitely the post for you. I’ll show you so many ways to put those old dishes to great use and you’ll be doing your part for the environment by keeping that much more trash out of the landfill. Imagine getting great décor or gift ideas and helping to save the Earth. This is such a win-win! That old frying pan and lid are perfect for making your little bird friends a nice feeder. The lid acts as a roof and keeps birds dry when it’s raining. 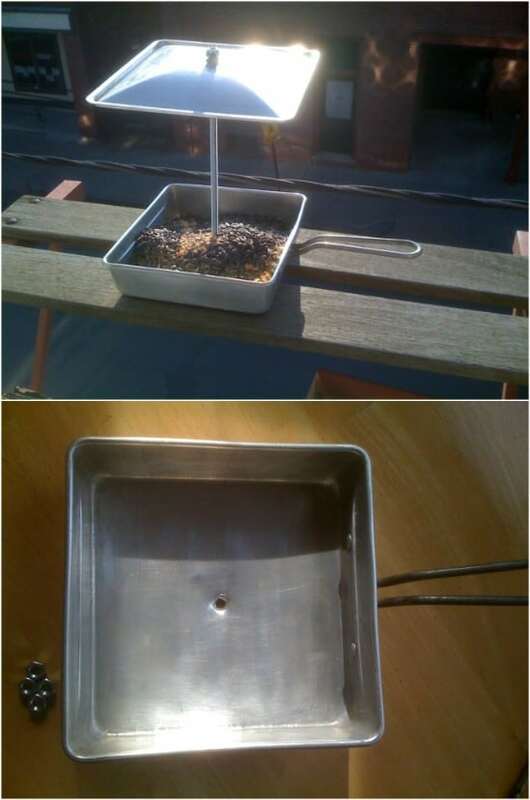 This is a really easy DIY bird feeder that will only cost you an old pan and lid. Just sit it out on the porch or deck when it’s finished and watch those birds flock to it. Or, you could attach it to a post and leave it out in the yard. Old cake pans are used to make this rustic art supply caddy. I found this one on Etsy and think it would make the perfect art supply holder. Or, you could also use it as a candy dish or cupcake server. Just attach those old cake pans together with a wooden dowel. You can also buy this one from Etsy for around $40. You can totally turn those old pots and pans into useful items. Just look at this lamp that has a bundt pan for a shade. 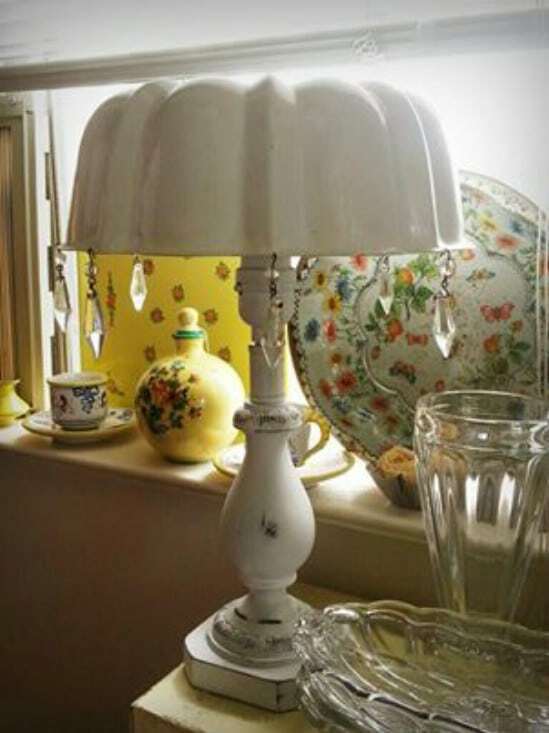 You’ll need the lamp base – use one that has a broken shade or you can pick up a lamp at any thrift store for around $5 or less. Then just add your bundt pan shade. You’ll want to paint it – or leave it old and worn, just sand down the rust a bit and you’ve got a beautiful vintage shade. I love this repurposed bundt pan wreath. It’s such a simple way to put an old bundt pan to good use. 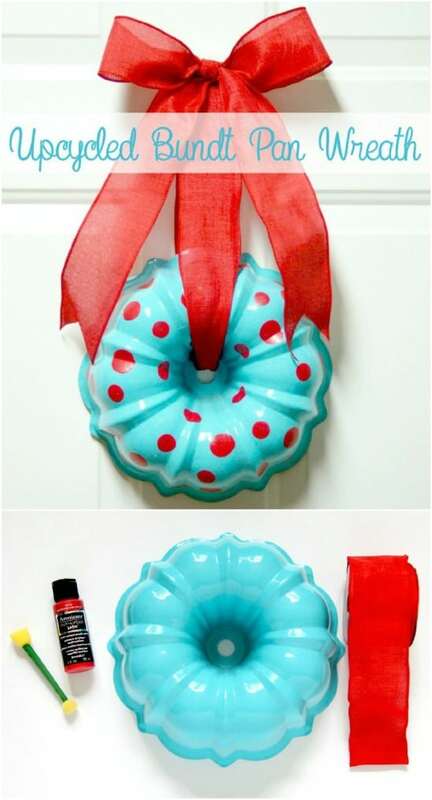 Just paint your old bundt pan in whatever color or design you want and then use a nice big ribbon to tie it up. You could do Christmas colors or choose spring pastels and have the perfect Easter wreath – you could even stick an Easter egg through the center hole for added decoration. This is a really easy to make stool that allows you to use any number of things for the seat – even an old spring form cake pan. 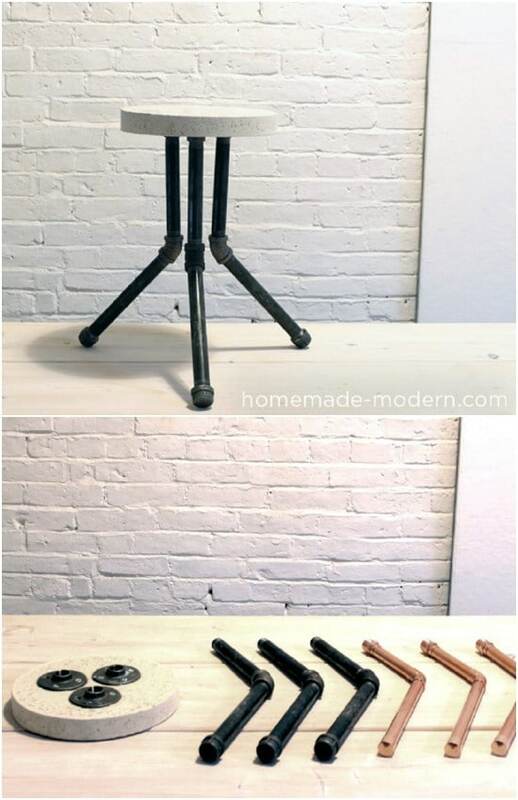 It’s a simple stool to make and would be perfect for the craft room or workshop. You’ll use the old cake pan to form the concrete – and you could also use it to form round concrete for your patio or walkway. Once the concrete sets, the pan just snaps apart so your concrete is easy to remove. 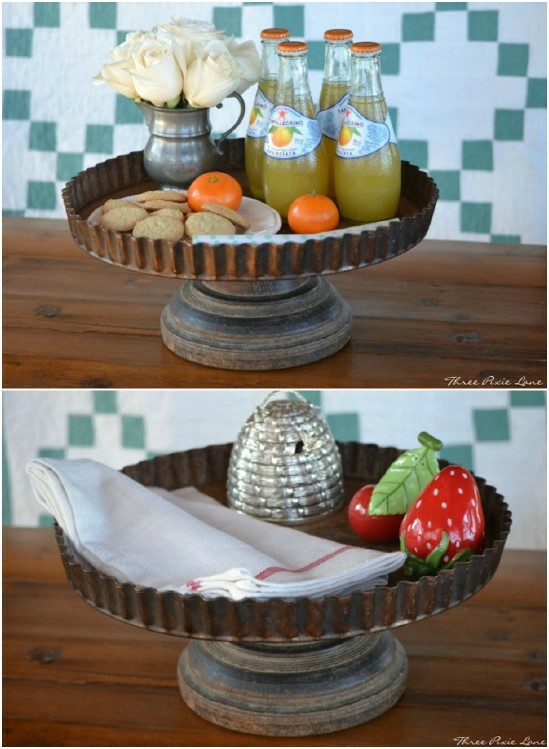 That old rusted quiche or tart pan can be turned into a lovely rustic looking cake stand. Just clean up your old pan and add a base, which could be any number of things from an upturned bowl to an old seed distributor. Use your imagination and make the pedestal something really creative. Then just attach the two and you’re all done. You have a lovely cake stand that you can also use for fruit or any number of other things. Those old Teflon frying pans can be turned into wonderful chalkboards. Remove any flakes of Teflon that may be hanging on the inside of the pan and then paint with chalkboard paint. This is a great little message area for the kitchen. 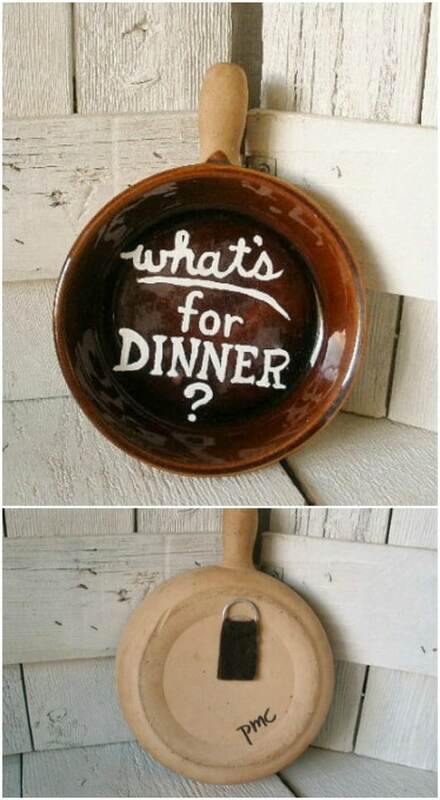 Just hang it from the handle with a nice little bow or a piece of burlap if you want a farmhouse look to it. These cast iron pans and skillets turned garden decorations are the most adorable things I’ve ever seen. They’re much easier to make than you may think, too. You’ll just need those old pots and pans and a few other supplies, plus some paint and imagination. 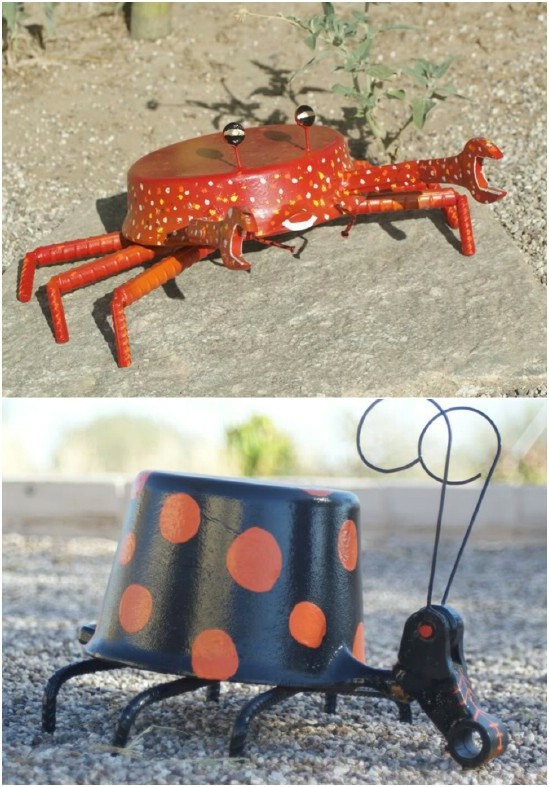 The crab is really adorable and you could make lady bugs or just about any other crawly creature out of those old baking and cooking dishes. 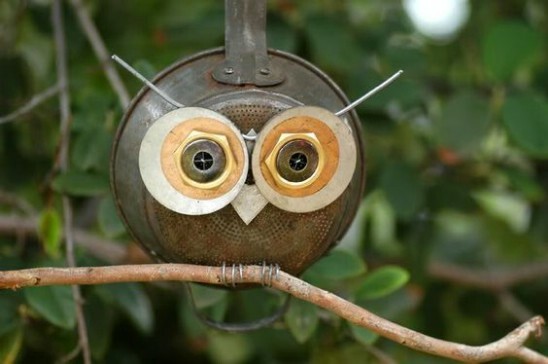 You could use that old metal strainer or any number of other pots and pans to create this adorable little garden owl. Just add the big eyes and a few other facial features and hang it anywhere in the garden where you want a bit of additional décor. I love the idea of turning old pots and pans into garden decorations and this little owl is just perfect for bringing some fun and whimsy to the garden area. Turn those old rusty cake pans into these beautiful garden planters and give your flower beds a little extra lovely touch. Just attach the cake pans together with metal dowels or you could use legs from old metal furniture. Add a base and other decorations and use those tiered planters to add some depth to your flower garden. These are easy to do and give you a great place to add those shorter plants so that they’ll be seen. 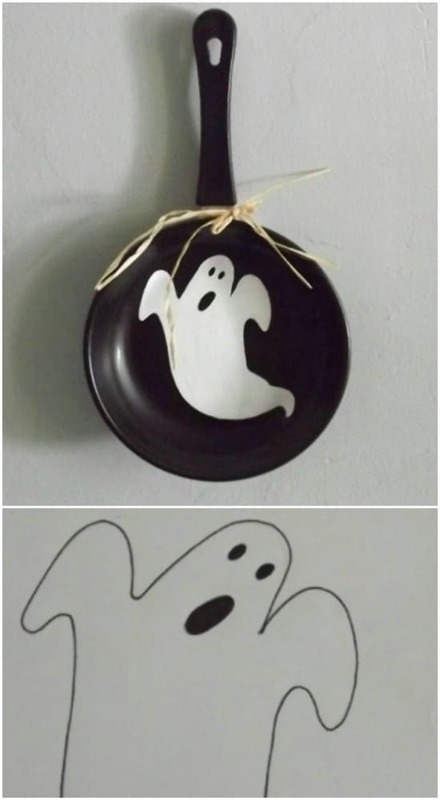 You can find a cheap frying pan at the Dollar Store or use that old rusted one that you can’t cook with any more to create this cute little Halloween decoration. Just smooth out the inside of the pan if you’re using an old one and maybe add a coat of black spray paint. Then paint your little ghost inside and hang it with twine or black ribbon. It’s cheap and easy and such a creative Halloween decoration. An old ceramic frying pan – or any old frying pan that you may want to repurpose – would make a gorgeous welcome sign for your front porch. Plus, it gives the porch that great rustic look and feel. I found this lovely ceramic pan sign on Etsy for $11. It’s got a great color and I love the hand painted welcome sign – you could do this yourself with a similar pan and customize your welcome message. You don’t even have to do much prep work to turn those old bundt pans into hanging planters. Paint them if you want and then drill holes on the sides to add your chains. Fluted pans would look beautiful as planters but you could honestly use whatever deep pans you have on hand. These would look great on the porch or hanging in the kitchen. 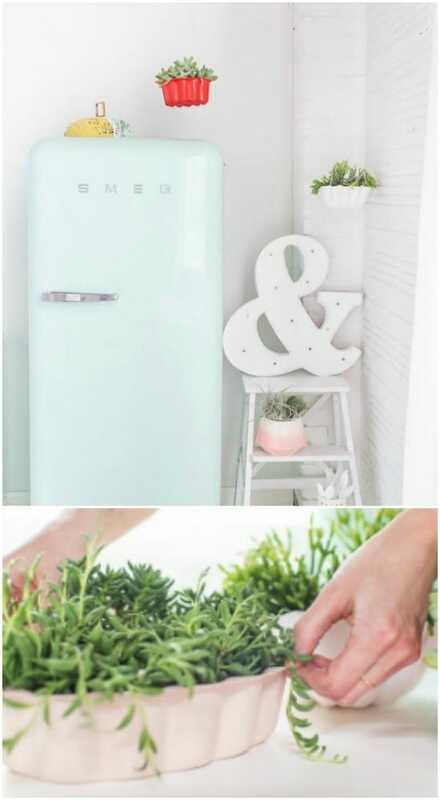 If you want to use more shallow pans, you could turn them into hanging herb planters. I have so many hummingbirds in my yard every spring. I never once thought to give them their own birdbath. I love the idea of turning an old cookie sheet into a bath for those tiny little birds and this is a really easy DIY project. 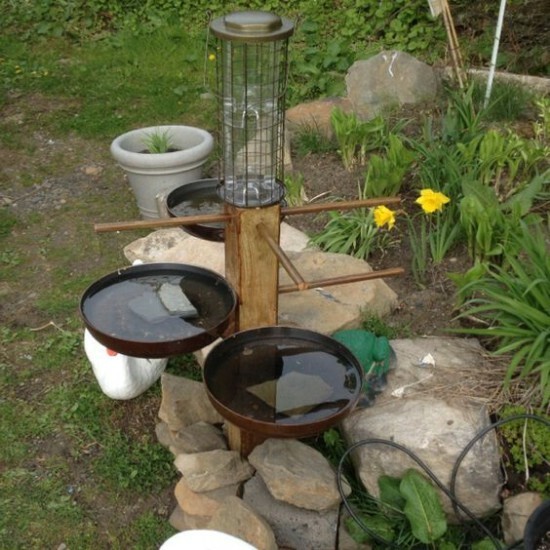 Your little bird bath can be hung on a tree and it incorporates running water so the little hummingbirds will love it. 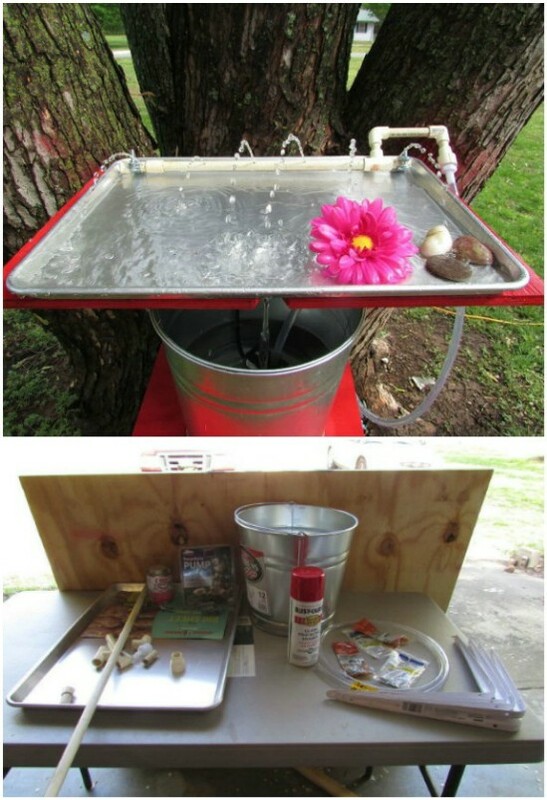 You’ll see so many more hummingbirds in your yard when you give them this little bath/play station. I have to admit, I’ve thrown out my fair share of bread pans in my life. I mean, what else is there to do with them when they get so old that your bread doesn’t come out well? You can turn them into these great catch all trays. Some paint and a bit of distressing along with a base or pedestal are all you need aside from your old loaf pans. This is a great tray for jewelry or you could put it by the front door to catch keys. A ukulele, really? Why not? I think this is the most creative way to put those old cake pans to use and you get a great musical instrument out of it. Kids will adore this – making it and playing it! When you make it properly, it will even play like it should. 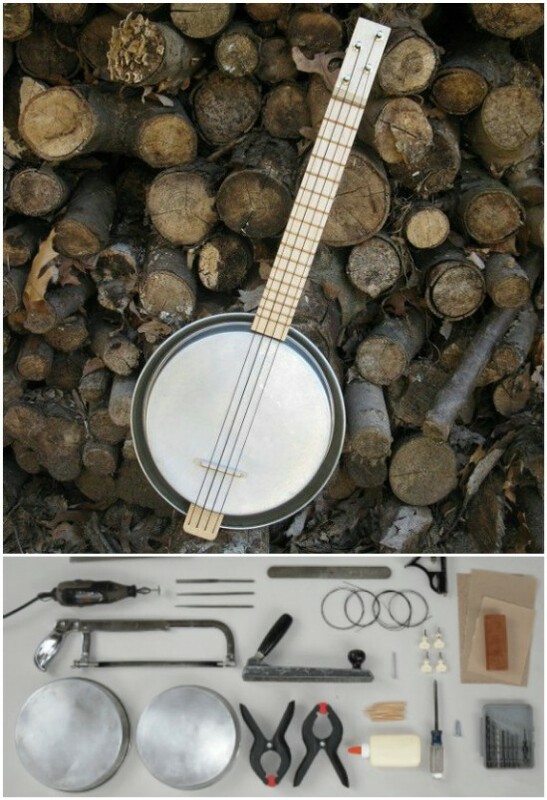 If you’ve ever wanted to create your own musical instrument, now is the time and you can use those old cake pans to help. Tart pans make wonderful picture frames! 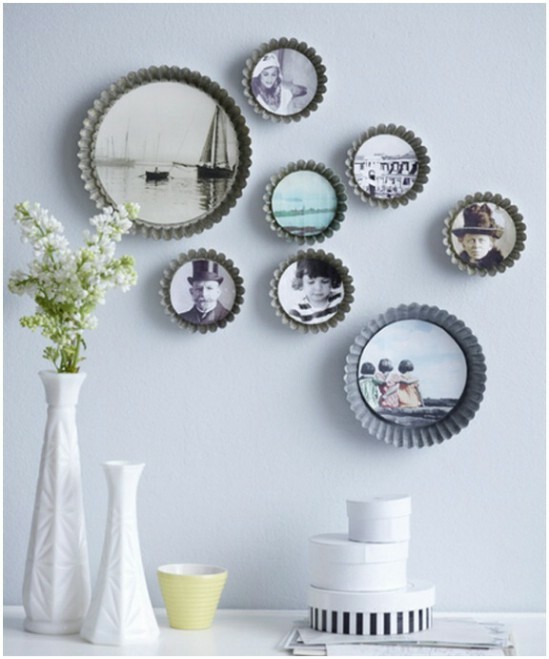 Because they’re often fluted, these pans have a great decorative quality and you can turn them into beautiful ways to display your favorite pictures. Just clean up your pans and laminate your pictures to keep them safe from dust and such. You can attach them to the pans by gluing or if you want to be able to swap them out, just cut the pictures so that they fit snugly into the pans. Then just pop them out when you want to add another image. You could go to Anthropologie to buy a sailor’s mirror if you wanted to spend about $50 or more. Or, you could repurpose that old cake pan into a mirror that looks just like what you would get from Anthropologie but costs about 10 times less. You’ll need spray paint, leather straps and a few other supplies. Even if you have to purchase everything you’re still saving a small fortune and these mirrors are stunning. If a nautical theme is in your décor future, these cake pans turned sailor’s mirrors are a must. Those old skillets or other shallow pans would make wonderful bird baths for your garden. You don’t necessarily have to have a huge bowl and pedestal to keep your birds happy. They just want water in a shallow container and those old skillets are the perfect depth. Just sit them out in the garden or you could build a tiered bird bath with a few skillets or pans and some wood and other supplies. Paint them to make them really decorative. If you’re into bird watching at all or photography, you know that ground pods can be pretty expensive. A ground pod is used in photography to get a super low angle and it’s especially helpful when photographing birds and other wildlife. 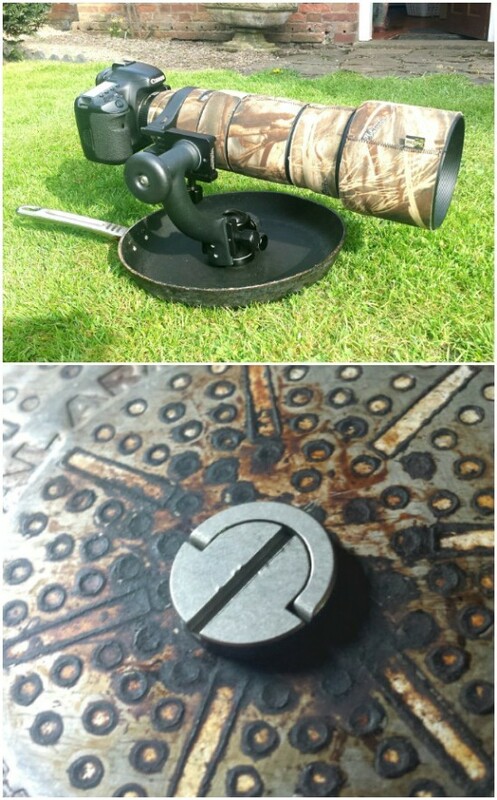 I’ll bet you didn’t know that you can make your own ground pod from an old skillet, did you? You can! And it’s one of the easiest projects on this list. If you’re an avid photographer you have to take a look at this DIY ground pod – it will save you loads over buying one. 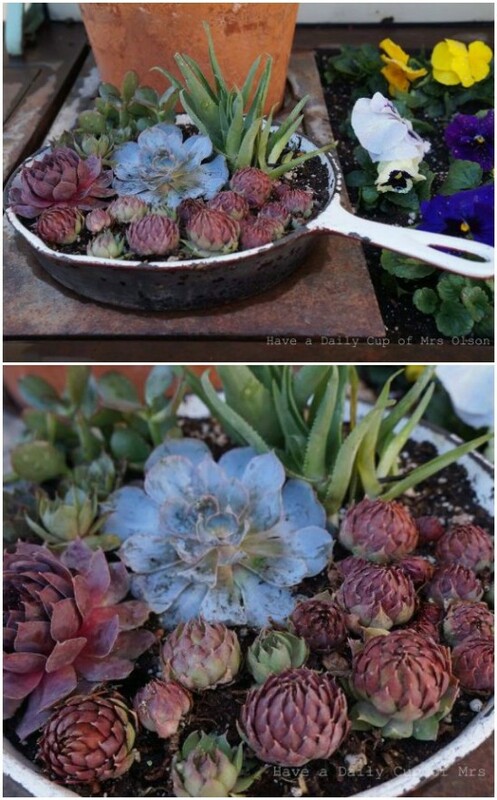 Those old skillets or pans would make wonderful succulent planters. I love the idea of using an old cupcake tin for this but you could use any skillet or pan that you have on hand. Just add a bit of potting soil and then stick in your succulent. This is also a great way to add some décor to your flower garden and keep your succulents separated from your other flowers. 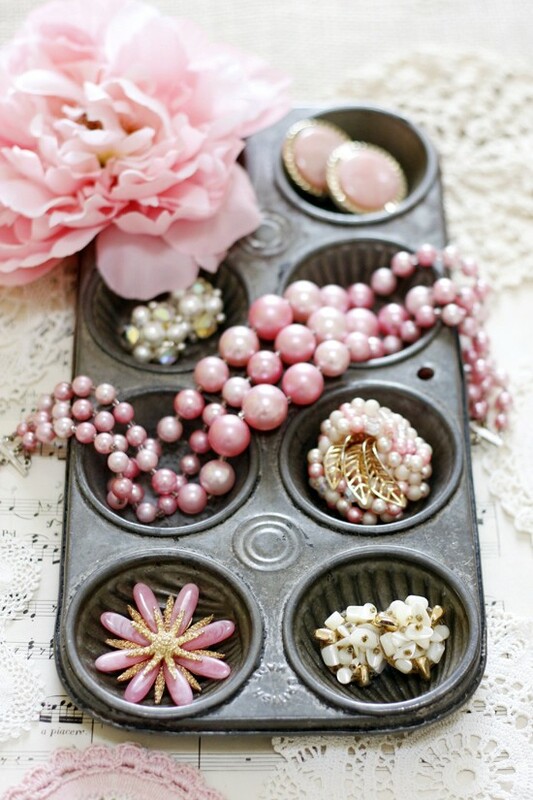 I absolutely love anything rustic in my bedroom which makes this cupcake tin turned jewelry holder one of my favorites. It’s so easy to make – you literally just have to walk it into the bedroom and place it on the dresser. You could of course, paint it and even add some decorative touches if you want. I love the idea of just using it plain and it’s a wonderful way to keep rings and earrings separated and easy to find. 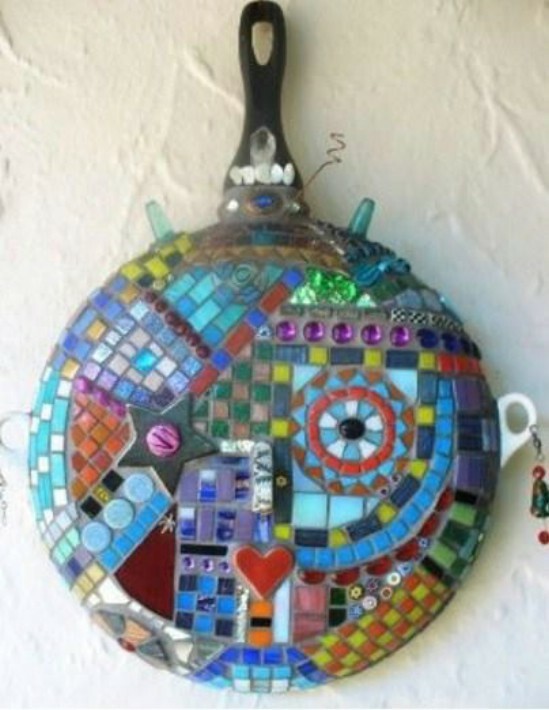 Those old tart or pie pans would make beautiful clocks for your kitchen. You’ll just need to clean them up a bit and maybe add a coat of paint. Then just use a clock kit that you can pick up at any hobby store like Michael’s or Hobby Lobby and you’re all done. 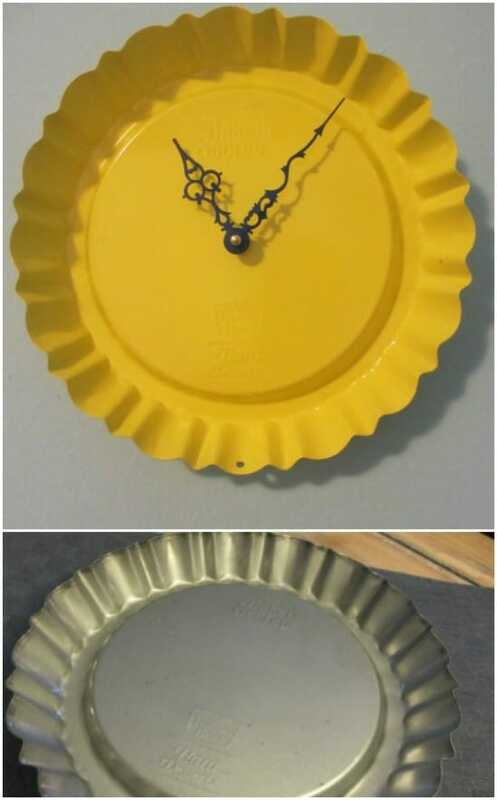 I adore the idea of having a DIY baking dish clock in the kitchen. It fits the cooking theme perfectly – and these would make wonderful gifts. 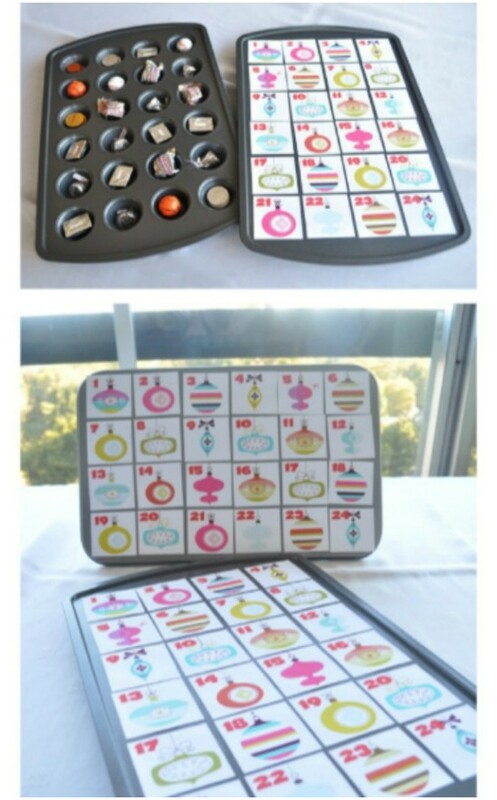 I realize the holidays are some time away but you have to admit that this advent calendar is the perfect way to put that old muffin tin to good use. You just cover the bottoms of the tins with felt and then add your toys, candies, money or whatever you plan to give. You could also paint and decorate if you wanted or let the kids create them. They’ll love adding their own personalization to their advent tins. Try recycling old chair legs in place of dowels.